Cruz Accuses Dewhurst of "Deliberate Falsehood"
Former Texas Solicitor General Ted Cruz said Lt. Gov. David Dewhurst made a "deliberate falsehood" when he said that he had never supported a payroll tax. Dewhurst's campaign says the allegations are "false and misleading." Former Texas Solicitor General Ted Cruz has accused Lt. Gov. David Dewhurst of making a "deliberate falsehood" during Friday’s televised debate for the Republican primary runoff for U.S. Senate. Dewhurst’s campaign says that Cruz is distorting Dewhurst’s record. “I have a very simple question: Did you support a payroll tax? Yes or no, and is that a good idea?” Cruz said. “No and no,” Dewhurst replied. “You did not support a payroll tax?” Cruz asked again. “No, I’ve never supported a wage tax, and I’ve never supported a payroll tax,” Dewhurst said. 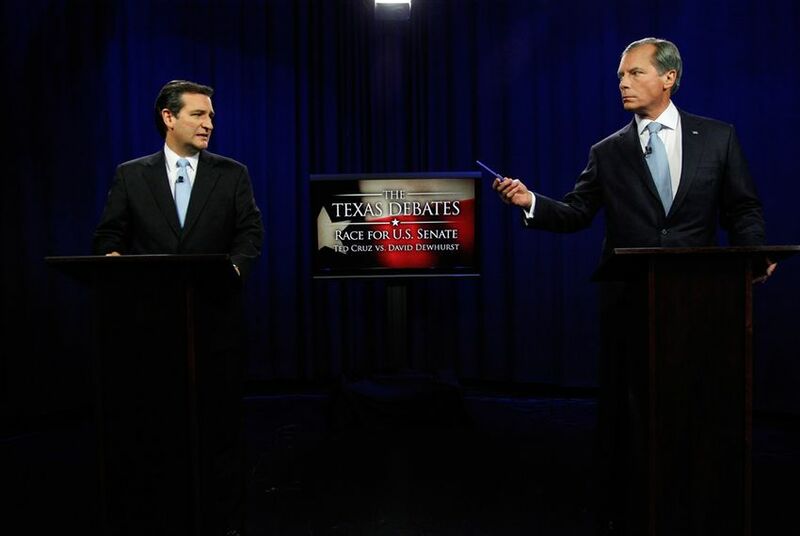 After the debate, Cruz said Dewhurst clearly misrepresented his past position. Beginning in 2005, the Legislature endured several special sessions trying to overhaul the state’s school finance system in response to an order from the Texas Supreme Court. The House and Senate were at odds over how to replace the state’s loophole-ridden franchise tax with a broader tax on businesses. By March of that year, the House had proposed a plan that included a payroll tax. Gov. Rick Perry strongly opposed such a measure, and Dewhurst said the Senate was also wary of the idea, according to news reports. In May, the Senate passed a package of bills that aimed to give businesses in Texas the option of paying a revised franchise tax or a payroll tax. Dewhurst in a press release praised the Senate for approving the plan. The measure never became law. The Legislature eventually created a new margins tax on businesses. “I don’t know how he defends [his statement] when he looks at his own press release saying, ‘We just passed a payroll tax. Hurrah,’” Cruz said. In a statement, Dewhurst spokesman Mark Miner said Cruz is “desperate and flailing” and that allegations that Dewhurst misrepresented his past position are “false and misleading.” He did not directly address Dewhurst's involvement in the May 2005 tax measure passed by the Senate.